“Life is more fun if you play games,” is a simple yet brilliantly accurate quote attributed to acclaimed author Roald Dahl. 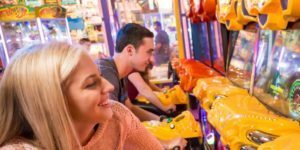 A visit to NJBIA member iPlay America, based in Freehold, will provide you with a vast array of games to choose from for an awesomely fun day. The layout and design of this 115,000-square-foot facility blends the Jersey Shore boardwalk with a New York City street featuring brownstones and shops intertwined with the excitement of indoor rides and attractions. Go Karts, bumper cars, two-level laser tag as well as a host of arcade games create an array of choices. Let’s not forget the “4D Theater” thrill ride, which targets four of your senses: seeing the action in HD 3D; hearing the booming surround-sound audio; sensing the action with elements like air, water and fake snow; and feeling what’s going on around you with intuitive motion seats. I’ll pause now for you to catch your breath. A day at iPlay also includes many food choices, such as Sonny’s Boardwalk Grill for Jersey Shore-style hot dogs, cheesesteak sandwiches, funnel cakes, and more. Or perhaps Mixx Frozen Yogurt complete with all the most popular toppings. If you have a sweet tooth, a stop at Broadway Sweets is in order, which offers Monmouth County’s largest array of current and old-fashioned candy in gift packages and bins. For more formal, sit-down dining, iPlay America’s Game Time Bar & Grill features an American-style menu as well as a multitude of flat screen TV’s to follow all the action for whatever your favorite sport may be. A staple of iPlay America is their ability to be great hosts for events, be it children’s birthday parties, corporate outings, charitable functions or whatever the memorable occasion may be. In fact, NJBIA hosted one of our networking events at iPlay America earlier this year and it received rave reviews. Plus, they offer periodic special events and some are very creative: Beyond “Breakfast with Santa”; “Grandparent Tuesdays”; and of particular note “Nocturnal Night,” which is for those 21 and over as it features a state-of-the-art light show and offers alcoholic refreshments. The sub-theme of Nocturnal Night is summed up in three words: Games. Fun. Booze. iPlay America is active in social media, and a visit to their Facebook page helps capture the fun and excitement that is generated by all that they offer. A testament to their success is the fact that they’ve earned a “Certificate of Excellence” from TripAdvisor, which is bestowed upon accommodations, attractions and restaurants that consistently earn great reviews from travelers. Congratulations to iPlay America for all their success to date. iPlay America is just one of 20,000 companies that comprise NJBIA’s membership, which is very diverse with representation from an amazingly wide spectrum of fields, industries and professions. Look for more unique stories about NJBIA members in future issues of “Beyond 10 West Lafayette,” NJBIA’s membership blog.